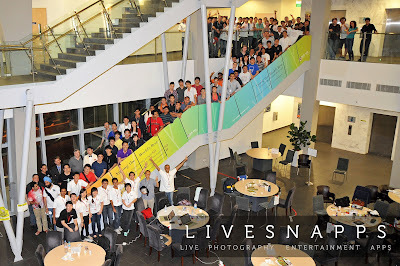 Yes, I finally attended my very first Startup Weekend in Singapore. And they live up to their reputation of being one of the most organized startup events and I dig their heavy emphasis on execution. Throughout 54 hours of working on startup ideas and observing how others approach the problem, there’s a lot of lessons that I’ve learned throughout the whole process. I know why Startup Weekend is awesome: within three days, you’ll be able to see the real social dynamics and the drama that unfolds as the teams manage themselves: both good and bad. It’s like getting a very condensed experience of what startup life is like. In Startup Weekend Singapore 2012, more than 60 ideas were proposed, 40 were selected for the initial pitching process through participant votes and only 20 got picked to proceed with their development. And 54 hours later, only 18 teams managed to survive to make the final pitch. And all 40 ideas that got picked for the initial pitching were a result of the “founders” going round the hall, reaching out, pitch the idea and ask for their votes. Whether is it by sheer awesomeness of the idea, pure persuasiveness of the founder or by pleading, begging or bribing, it doesn’t matter: you’ll need to do the legwork to reach out, communicate your ideas and have them vote for you. And during the event, all you need is about 7 votes to get into the top 40 ideas. If you don’t reach out, your startup idea is already pronounced dead on arrival. So if you want your idea to be heard and garner attention, you better don’t lean against the wall with a drink in hand: get into the crowd and pitch. So now you got into the top-40, congratulations! Now you need to pass through the second filtration gate. This initial pitching session is the time when you can separate those who came prepared and those who just fumbled their way through. Every person is given one minute to deliver their elevator pitch, and the amount of preparation effort you put into it will be evident the moment you open your mouth and speak. The importance of the elevator pitch is two-folds: you are not only impressing the mentors who would decide the top-20 ideas that they think would be worthy for the participants to focus on; more importantly, you are trying to recruit team members who would help you in your cause. Remember the fact that in Startup Weekend, there aren’t many developers who happen to be free-agents during the event — in most likelihood teams are formed even before the event starts. And it’s just human nature to cluster yourself among the popular groups. That means that you better prepare a compelling pitch that will make your team the honey pot that attracts implementers. If you are a business development person, failing to do attract implementers is an instant kiss of death. Just ask the two top 20 teams that withered away during the event. Depending on how the team performed in their initial pitch, you either get into a very popular team, or a team where you can hear the crickets. And, if you happen to be in the unpopular group, be prepared to either take the uphill battle of wooing developers to defect to your team or eyeing the remaining few aimless and wandering souls and pounce on them. However, that doesn’t mean that you should get all the help you get — with serious time constraints in getting your startup ideas off the ground, you should value your team fit way more than the amount of people in your team — as you want your team to be working as smoothly and swiftly as possible. Dealing with distractions caused by misfits will drag your down. You must be able to weigh in several factors such as their skills and what they can contribute, availability of mission critical tasks he can take on and making a gut check on whether he’s able to gel with the key decision makers (i.e. the “CEO” and “CTO”) in the team. If you want to be a startup founder, better train and hone your intuition capacity in Startup Weekend and be firm in rejecting misfit hires politely — it’s nothing personal, it’s just business. What happens if you have a Ruby developer, a PHP developer and a .NET developer on the same team? Duplicate effort in working on the exact same prototype. You don’t want such waste to happen during Startup Weekend. Getting a great team on board is a blessing, but magic will not happen if you can’t orchestrate and conjure the spell properly. Enter Management 101: everyone in the team needs to reach a common agreement what needs to be done and distribute the tasks that’d maximize output. That’s the reason why some teams formed themselves before the event: it’s like having a jazz band with the members able to read each others cues before the show started and you have to deal with less overhead in getting everyone on the same page. If you happen to only form teams during the event, better brush up your project management skill or you’ll have to deal with discontent, misunderstandings, inefficiencies and drama. Doesn’t sound all that complicated, right? Well, spend some time working on it and you’ll open a can of worms called hard work — building a rock solid pitch, identifying unique selling points, customer research and validation, working on a prototype that you can demo etc. In most likelihood, you would at some point hate the startup idea once the hard work that needs to be done is being laid in front of you. With the time constraint that dangling on top of your head, brace yourself, buckle up and always keep your intentions and passion in mind — it’s going to be a roller coaster ride, baby. While you and your team are busy at work, there’ll be low times that hits you out of the blue — frustration when faced with a brick wall, anxiety and helplessness when nothing seems to work, exhaustion after a late night rush etc. Even more common would be that there’ll be times when you or your team members will freak out at the sheer amount of work that needs to be done and there’s just not enough hours to get all bases covered. The early phases of building your startup is usually a stressful one and it’s normal to be freaked out from time to time. That’s the whole purpose of forming a great team — having a support group structure where the members would not only support each other in terms of skills but also acts as the necessary emotional cushion that’d pad the stress that pounds you. To developers, remember this is not a hackathon. To highly-excitable visionary “CEOs” in the team, diluting your developers resources into jamming more features in your next world changing, paradigm shifting, industry disrupting location aware mobile application demo is as good as being left with a thick Powerpoint slide deck and no working demo. And potential investors in the room don’t want to fund yet another startup that just looks good on Powerpoint and have nothing to show for it. If you don’t have enough development resources, focus in developing on the core user experience and forgo the backend. That’s the strategy that I employ for the SmartTasker team. If your startup idea is any good and you are able to sell your dream, you’ll manage to find someone to flesh out the nuts and bolts after the event. Finally, the moment of truth after 54 hours of pure hustling — it’s time to do the final pitch in front of a panel of judges and potential investors. In short, Shark Tank, baby! In Startup Weekend Singapore, there are three teams who are working on different variation of marketplace to crowdsource tasks: Juubs, Mystery Shopper and SmartTasker, the team which I’m on. In my opinion, the scenario of having several teams working on a same idea but with a different twist is commonplace: after all, ideas are cheap and it’s easier to come up with variations of a startup that works. The only way to separate yourself from such a crowd is to have a very strong and sharp unique selling point. While Juubs and SmartTasker attempts to target to broad customer segments with the “you can do anything on our marketplace” tack, Mystery Shopper stands out by focusing on what problem they are trying to solve — to allow small and medium businesses to measure their quality of service by “recruiting” an army of crowd-sourced mystery shoppers. Just by being really focused on the problem they are trying to solve, I personally find that makes the pitch solid, intriguing to listen to and creates a lasting impression. Same goes with life, there’s a lot of valuable lessons from mistakes of others — some of these mistakes are so fundamental that they should never be committed and could be spotted and remedied with sufficient preparation. During the Q&A session with panel judges and potential investors, my major pet peeve is to hear the phrase “Like what I said just now…”. Purge this phrase off from your memory bank for good and give yourself a couple of hard slaps every time you catch yourself saying it. One, it is a meaningless preamble and it’s most likely followed by a weak defence. Two, you assume that the judge or potential investor are not paying attention to your pitch. And three, you’ll come off condescending and arrogant. Remember, you are not defending your graduation thesis here. If you feel compelled to use this phrase at all, take a pause and try to understand what is being asked, or even better ask a follow-up question. I would love to highlight one awesome feat during the event: the StarCall team built not one, not two… but three idea over the course of two days! Meet Richerd Chan and Kai Loon — the programmer and designer combo who achieved the impossible. Richerd’s idea of Hullo, a simple iPhone app that facilitates contact exchange during events was shot down from the preliminary top-40 ideas, but that didn’t stop him from having it built. After 8 hours of hardwork without sleep, Hullo is built and fully working — and that created great buzz for the team. Everybody who have their hands on the app are amazed. That’s why we gets us excited about working prototypes: it shows a glimpse of what change you are able to bring to the world and showing them that you can do it. Hope this story inspires you to build what you are most passionate about — after all, that’s what startup life is all about :). While we are on the topic of startups, if you are in Kuala Lumpur and you are an established startup founder, or startup founder-to-be, do check out the Webcamp KL Open Coffee Club. It is a bi-weekly networking meetup that I’ve organized for startup founders and talents to network with each other and to allow everyone to support each other in the long journey of entrepreneurship. Sounds like a place you want to join? Like our Facebook page to get updates to the next event!